A life so full of achievement as Kailasapathy’s was not without its critics. Once when one of his critics made a particularly petty observation I was moved to remark ‘He is the only genius we have in Tamil studies’. My friend demurred at genius, but was willing to concede ‘He thinks a lot, and reads a lot’, about Kailasapathy. This year marks the 75th birth anniversary of Tamil scholar Professor K. Kailasapathy, the founding President of the then Jaffna Campus, University of Sri Lanka. Born on April 5, 1933, Kailasapathy admittedly had a short life span and died on December 6, 1982. 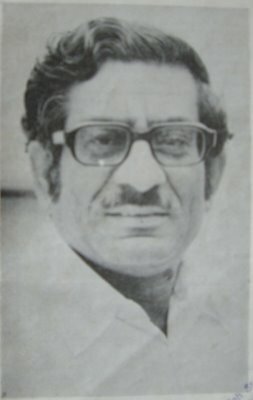 Due to his political affiliations with the unpopular Sirimavo Bandaranaike rule from 1970 to 1977 and politicking for administrative positions, Kailasapathy (while alive) had his pro- and anti-constituencies among Tamils. That all trend-setters in their chosen disciplines have both the pro- and anti-constituencies is an established fact. And Kailasapathy was no exception. Some among the Tamil columnists/memoirists recently have attempted to eclipse the damage done by Kailasapathy in undermining the practioners of traditional Tamil scholarship by calling them antiquated by exaggerating the merits of Kailasapathy’s scholarship. In political pole-climbing contests, Kailasapathy was also not without blame. Kailasapathy’s crass ingratitude to one of his mentors, Prof. S. Vithiananthan has been placed on record four years ago by physician-literratur C. Sivagnanasundaram (Nandhi), who knew the principals somewhat intimately. This document deserves translation from Tamil. I present below two evaluations. The first (pro-Kailasapathy) view was from Professor R.S. Perinbanayagam, then at Hunter College of the City University of New York. This item, appeared in the Lanka Guardian of March 15, 1983. Shortly after Kailasapathy’s death, I met Professor Perinbanayagam (son of Handy Perinbanayagam, renowned Eelam educationist) at his New York apartment. For a few hours, we exchanged information on the politics and literature of Sri Lanka. As of now, this happened to be our one and only meeting. I was not aware then that he was intending to contribute this Prof. Kailasapathy eulogy to the Lanka Guardian. The second (anti-Kailasapathy) view was from me. After reading Prof. Perinbanayagam eulogy, I wrote to Profesor Perinbanayagam, expressing my dissent on elevating Kailasapathy to the ‘only genius’ status in Tamil studies. I don’t remember that I received any response from Prof. Perinbanayagam for my letter. To remember Professor Kailasapathy’s deeds, I provide below both the pro- and anti- Kailasapathy evaluations. It was not given to him to complete a full span of life, but within the short time allotted to him, he was not only a creative thinker and writer, but had a unique capacity to inspire others to write and create too. He was able to revitalise the Tamil literary culture from the moment he became editor of the Thinakaran, though he was ably assisted in this task by various gifted writers and critics. However, the vision of a progressive literative produced locally by the native sons and daughters and free from the silly romanticism and sentimentalism of the Tamil writers of the popular Madras journals and a critical sensibility to nourish it was his alone. In his student days at Jaffna Hindu College and Royal College, this vision began to take shape and it was clear to him that the emergence of a strong critical tradition was essential for the vision to be given reality. He began to train himself in the critical tradition of other literary cultures besides his own and inspired others to follow suit as well. In these tasks he was much ahead of his contemporaries and perhaps even of his teachers. When the opportunity came his way to put these ideas into effect, he seized it with alacrity. It was a bold venture in the late fifties and early sixties for an editor of a leading Colombo newspaper to publish work that was decidedly leftist in orientation. But boldness and the courage of his convictions were never wanting in Kailasapathy and with this gesture he launched forth a veritable literary renaissance in Tamil writing in Sri Lanka. It is not his administrative and cultural leadership that will be remembered in the years to come, however, considerable though his achievements in this field were. Rather, it is his own creative work that will be considered, in many ways as pathfinding ones. His early interest in the emergence of a critical tradition in Tamil eventually lead him to write one of the first books on literary criticism. I believe he also taught a course on practical criticism for a long time in both the Peradeniya and Jaffna campuses. This work is a very erudite and sensitive one and is notable for its capacity to intermarry the Tamil traditions of critical inquiry with European ones. There is no slavish imitation of the European tradition, but nonetheless a clear understanding of the work of the great George Lucasz is evident. This breadth of perspective he was to bring to the tasks of reviewing and criticism that he produced too. Many writers were assessed by him in many of his articles and books and though some were no doubt hurt by his comments, they were rendered with a full sense of responsibility. Both the particular judgements that he brought to the work as well as the general standards that he upheld are likely to have a lasting impact. The sense of an inner discipline and a sureness of touch that one finds in Kailasapathy’s work comes from a philosophical commitment that he made early in life. Historical materialism has within it a capacity to inspire unrealistic utopias and convert itself into creeds and dogmas. More significantly however it has generated a certain attitude to society and social change, to rights and obligations of society to its members, and above all a freedom from cant and hypocrisy. In many many parts of the world today, those who have been totally or partially touched by this philosophy of history and methods of analysis are in the forefront both of literary criticism and ‘culture criticism’. Kailasapathy’s work too derives a great deal of its strength and disciplines from a commitment to historical materialism. And it could be said that historical and literary studies in South Asia were crying to be rescued from the army of soothsayers and hosanna-mongers by such a discipline and commitment. He was committed to the modern spirit of analytical examination of texts and to the emergence of new forms in writing in Tamil, but such a commitment was not achieved at the expense of knowledge and study of the classical tradition. His familiarity with ancient Tamil texts was second to none but in analyzing them in his many writings he was once again to bring not only a very modern critical sensibility, but also to demonstrate a skill at socio-historical analysis that a normal historian could well envy. The careful attention to the contemporary meaning of the texts, the measured judgement of the available evidence and an unwillingness to accept the patriotic judgement of far too many commentators in Tamil are all evident in his work. Literature was not an epiphenomenon for Kailasapathy, not certainly to be read closely for its textual integrity and left there. Nor did he hope to ‘save civilization’ by hurting for imagery and searching for telling metaphors. Literature was an expression of the ethos of the society in which it was created and the function of the critic was to engage in ideological exposure as well in judgement of literary quality. While many of his essays could be cited here, his Tamil Heroic Poetry alone would suffice. It is ostensibly a work in comparative literature. Kailasapathy analyses certain ancient Tamil works here in comparison to the European (Greek, Irish, Welsh) bardic tradition and comes to a number of noteworthy conclusions. In addition, he is able to make a significant contribution to the discovery of the socio-historical circumstances under which these ancient Tamil writings were undertaken. The intimate relationship between the kings of the Tamil land and the major and minor poets of the time, the economic and social contexts in which they functioned and the particular occasions in which poets wrote/sang their compositions are all revealed here. One is able to obtain a complete explanation of the poems themselves as well as certain features within the poems by the sociological circumstances that he describes. The cultivated exaggerations of various kings in ancient Tamil texts, their emergence as mythic figures, it turns out, were both a prosodic convention as well as the fulfillment of a contractual responsibility between the poet as a ‘hired hand’ and his royal patron. One can even go a step further and wonder whether the prosodic conventions themselves could have arisen in response to the sociological situation of the poet itself. It is however in his Valvum Valipadum (Social Life and Religion among the Ancient Tamils) that one finds his most original and thought provoking contribution to the sociology of knowledge. In the preface to this work he wrote ‘I have tried to show that literary ideas as well as literary forms and techniques are outgrowths of given social forms.’ It is not only purely literary matters that concerned him in this work, but the larger gamut of religio-literary documents of the early Tamils. In many ways it is an exemplary analysis and if translated into English will undoubtedly obtain a very favourable response from the international sociological community. In the first chapter he traced the origins of the conceptions of god and religion among the ancient inhabitants of southern India with the aid of historical/archeological works and Tamil religio-literary texts. This is followed by chapters that very coherently interlace historical and anthropological data with the Tamil literary texts and tries to illuminate the latter. In all of his work, Kailasapathy tries to rescue Tamil studies from the mindless chauvinism and a historical hagiography into which far too many Tamil scholars had taken it. Not for him the comfortable self-congratulations of the DMK school of writers, or the easy essays in Dravidianist hyperbole and political partisanship; rather, in the words, he used to dedicate one of his works to his former teachers, Prof. K. Kanapathipillai, he continued in his work ‘the traditional culture of the East with the methodology of the West’ and found his métier in it. Hope you won’t be surprised to receive this letter from me. Recently I had the opportunity to read your article on Prof. Kailasapathy, which appeared in the Lanka Guardian of March 15, 1983. Sometimes, I get these issues by airmail, but sometimes they arrive in surface mail; so only last week, I received the March issues. (1) For me, it seems that your article seems to be an eulogistic one; and what was missing was that you haven’t touched some of the weak points of Kailasapathy’s studies. By omitting this aspect, I feel that you have not done credit to the stamp of quality which Kailas was trying to integrate into the Tamil literature. What happened to the ‘literary criticism’ aspect of Kailas’ works? Are they without any flaws? I hope, certainly not. b) Contribution to the educational literature in Tamil. c) Compilation of bibliographic work on Tamil studies. d) Editorial abilities to publish a reputed, research journal ‘Tamil Culture’ for a lengthy period. May be, since he aligned himself with the Federal Party in the mid 1950s, he may not be agreeable to you as a pioneer of Tamil research. How could you miss the pioneering aspects of Swami Vipulananda? What has Kailas produced, comparable to Swami’s ‘Yaal Nool’, which todate stands as the only evaluative piece of research work on Tamil music? And you could remember that Swami had the scientific background (with a B.Sc in physics), which none of the other Tamil scholars have not had. Even the diverse contributions of Vithiananthan are quite impressive, not to be neglected. In terms of versatility of scholarship, I feel that contributions of Swami Vipulananda and Vithiananthan score high points in the Tamil studies, than the literary output of Kailas. It is a pity that even scholars of repute, like Prof. Indrapala have omitted to record the contributions of Swami, in his chapter on Tamil literature, in the ‘History of Ceylon’, vol.3, edited by K.M. de Silva. He even doesn’t mention the name of Yaal Nool in his essay. Shame on him! May be that these Tamil scholars (Kailas included) have neglected the music literature in Tamil completely, due to their limited knowledge (or ignorance, if I put it strongly!) in this art. I consider this as a glaring piece of omission in the critical analysis of Kailas too! Has Kailas done anything comparable to the painstaking work of Vithi’s like collecting, compiling and editing the folk music literature of Tamil peasants of Ceylon? If we consider the traditional trichotomous classification of Iyal [prose] , Isai [music] and Nadagam [drama], I could see that Vipulananda contributed to Iyaland Isai aspects of Tamil literature. Vithi had contributed in all three aspects of Tamil literature; while Kailas’ works are limited only to the Iyal aspects of Tamil literature. May I know your comments on the views I’ve mentioned here? What I’m contesting is your categorical statement, “only genius”. May be, Kailas could be classified as one of the trend-setters of Tamil studies, but not to be elevated to the level of only genius. With kind regards. P.S: I’m sending to you, under separate cover, a copy of my book ‘Tamil Isai Theepam’ which had recently been selected for Sahitya Prize award (for research) for the year 1977, five years after its release!